The Tri-Village MVCTC FFA Chapter competed at the State FFA Soils Evaluation on Oct. 13. The Urban team members were Jonathon Crawford, Maddie Downing, Meghan Downing and Jadyn Sharp. The Rural team members were Madison Crawford, Gavin Lochard, Christyana Roberts and Jenna Godown. NEW MADISON – The Tri-Village MVCTC FFA Chapter competed at the State FFA Soils Evaluation on Oct. 13. This was the third straight year for the Urban team to qualify for state and the first year for the Rural team. The Urban team members were Jonathon Crawford, Maddie Downing, Meghan Downing and Jadyn Sharp. The Rural team members were Madison Crawford, Gavin Lochard, Christyana Roberts and Jenna Godown. The Urban team placed ninth out of 47 teams with the individual scores being Jonathon Crawford, 43rd; Maddie Downing, fourth; Meghan Downing, 59th; and Jadyn Sharp, 124th. The Rural team placed 20th out of 49 teams with the individual scores being Gavin Lochard, fourth; Madison Crawford, 126th; Christyana Roberts, 88th; and Jenna Godown, 137th. There are more than 320 FFA chapters in the state of Ohio with more than 25,000 FFA members. 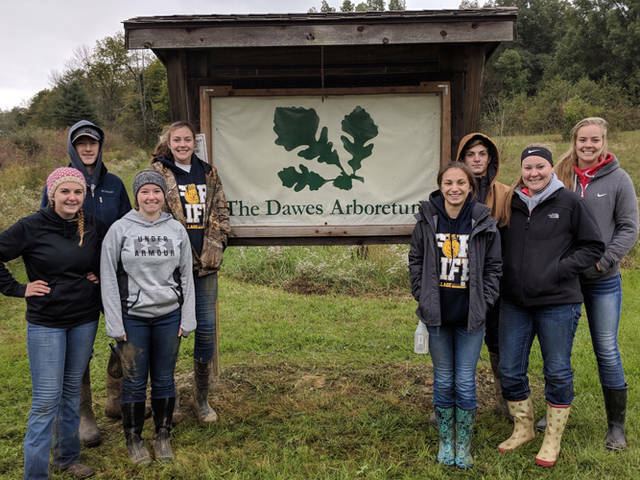 The Tri-Village Agriculture Education Department and FFA is a satellite program of Miami Valley Career Technology Center.